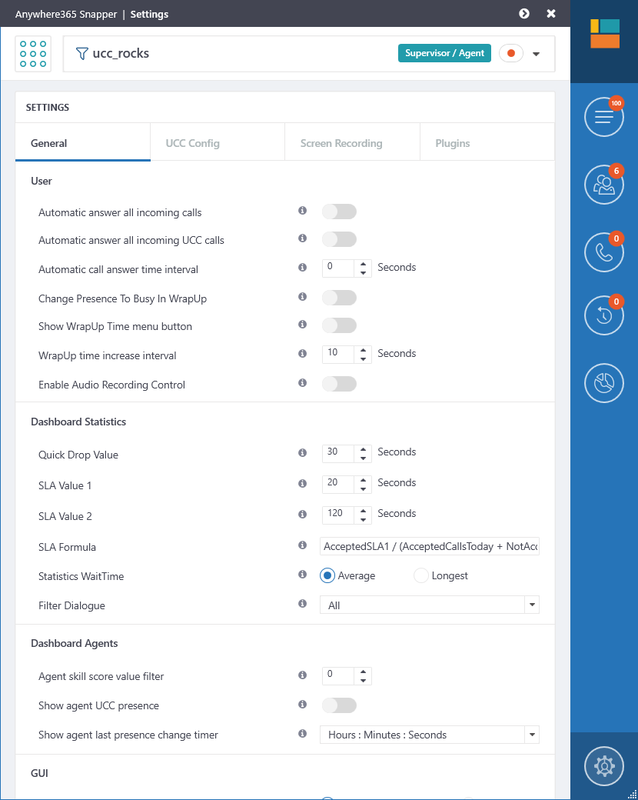 The Anywhere365 Snapper can be used to display real-time information about an UCCUCC stands for Unified Contact Center and consists of a queue that can be handled by Agents Each Contact Center has its own settings, interactive voice response questions and Agent with specific skills. Agents can be member of, or sign up to, one or more Contact Centers.. 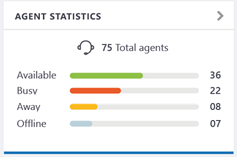 The dashboard gives you a quick insight of what is currently happening in the selected UCC, it also gives you quick controls the agent features like discharge, call on behalf, and reason codes. Below each component of the Dashboard from top left to bottom right. 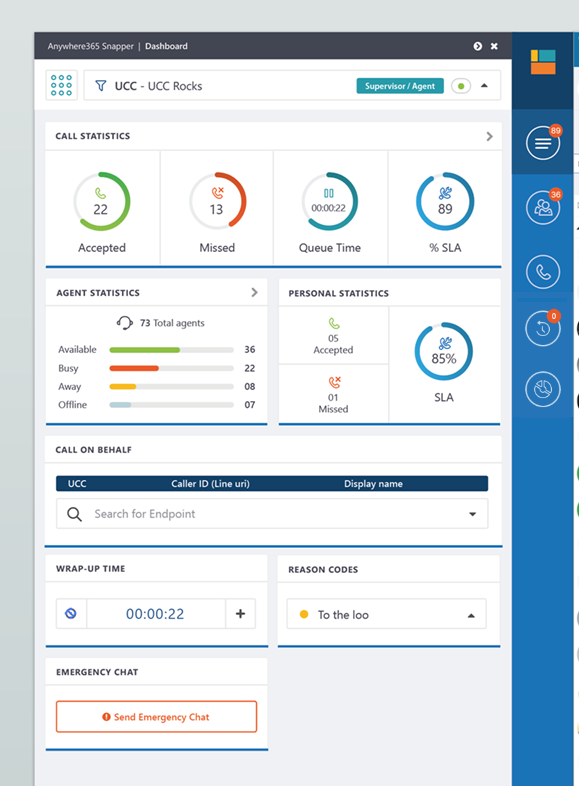 The DCI (Direct Call InterceptorThe Interceptor is a service installed on the Lync / Skype for Business Front End(s). It monitors all the calls going over it. When a call going to or coming from an Agent it will come in to action. 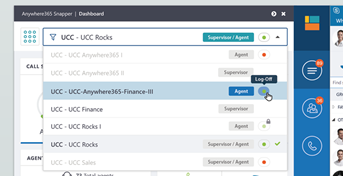 By intercepting that call and redirecting it you the Anywhere365, it lets you manage the Direct Inbound and Outbound dialogues of the Agents.) offers the functionality of the Interceptor to customers who are federatedFederation makes it possible to communicate with customers, suppliers, partners and others, via Lync Server 2010 and Lync Server 2013, which are not in the same Lync environment. or in a hosted solution. It lets Anywhere365 handle your outbound dialogue. When the requirements are met the user can typ or click in a number, then press enter or click on the call sign. The UCC will now setup a call to the user and then call the entered number. 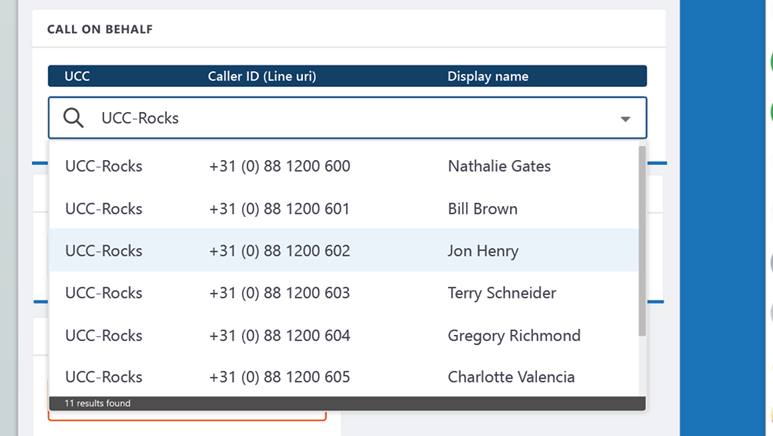 When the user is an agent or supervisor in multiple UCC you can use this drop down to switch between UCC. By default the UCC are auto-discovered or can be added manual using the settings. When opening the dropdown you will see a list of all the found UCC (auto-discovery) and added UCC using the settings. Some controls will only be active when you are a supervisor. Red with lock icon = Informal agentWhen a person is set as Informal Agent it is always an Agent in the Agent circle., you cannot sign out of the UCC. Green = Formal agentA Formal Agent is able to sign in and sign out of an UCC. This can be achieved when the Agent sends a start or stop command to the Lync or Skype for Business client of the UCC., active. Click to sign out. Red = Formal agent, not active. Click to sign in. Empty = You are not an agent. This item shows you the call statistics of the selected UCC for today. You can manipulate the values using the settings. More details can be seen by clicking on the item. Percentage based on the formula in the settings. Note that the Snapper uses a simplified source for the statistics compared to the Dialogue Intelligence (reports). Dialogue Intelligence distinguishes between Missed and QuickDrop, Snapper combines them as Missed. Dialogue Intelligence distinguishes between Inbound, Direct, Outbound, Snapper combines them. Dialogue Intelligence distinguishes between Hunts and Forwards, Snapper combines them. This items gives you a quick overview of the active agents in this UCC. More details can be seen by clicking on the item. This items show the users personal calls today. Note The information is from the point the Inflight Snapper is started. Agents with the Inflight Snapper and Outbound Interception, can see their outbound LineURI. User is Agent in a Outbound UCC. In the Call on Behalf item you can see your current active endpoint. You can switch between active endpoint by opening the dropdown and select the desired endpoint. 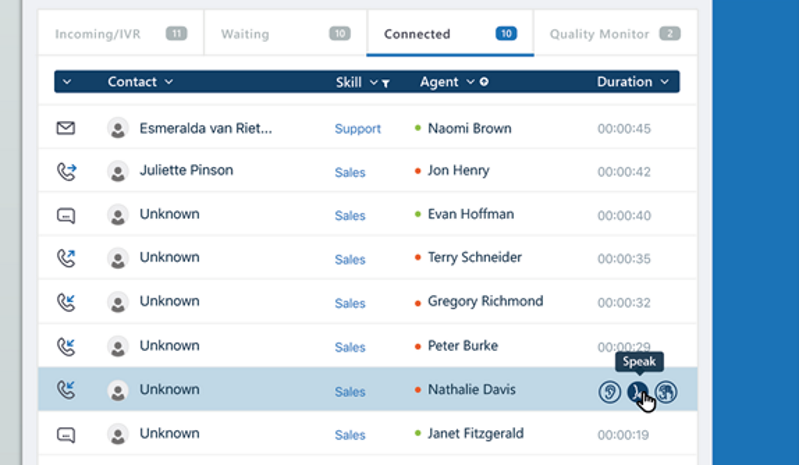 Agents with the Inflight Snapper can see and manage their Wrap-up time /Discharge Duration. DischargeDuration (on UCC settings) must be 1 or higher. You can change the Wrap-up interval in the settings. The reason codes let agent use custom states on top of the existing Skype for BusinessSkype for Business (formerly Microsoft Office Communicator and Microsoft Lync) is an instant-messaging client used by Anywhere365. In order to use SFB, a Microsoft Skype for Business Server is required. Skype for Business is enterprise software; compared to Skype, it has different features that target businesses. presences. 1 or more Reason Codes need to be defined on the UCC settings page. 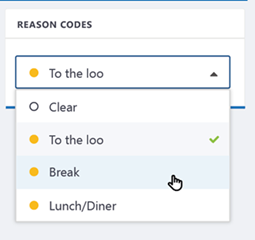 In the Reason Code item you can see and manage your Reason Code by opening the dropdown and selecting the Reason Code. In the second button of the Snapper all Agents of the selected UCC will be shown. If the user is a supervisor you have to remotely change the presence of the agents. Remote presence updater installed on applications server, Learn More. 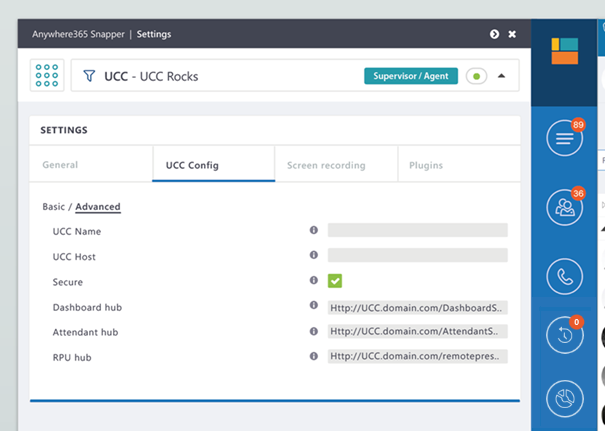 Remote presence updater is checked on in the client UCC settings. If the Agent is not offline the user has the option to select a dropdown en change the presence. 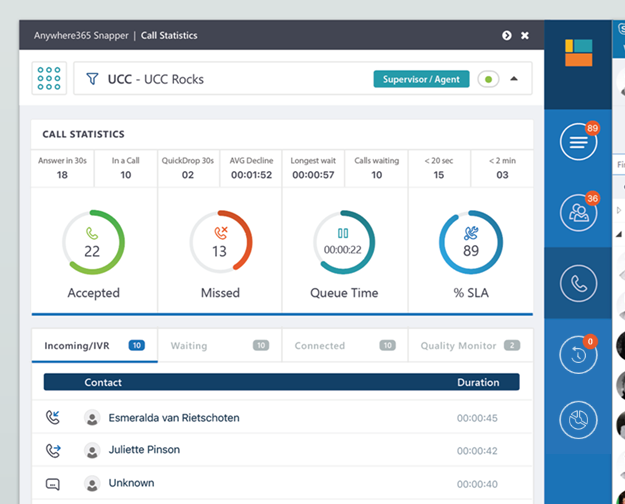 In the next button of the Snapper Call Statistics and all the Calls will be shown, whom are connected to the selected UCC. In the third button of the Snapper the statistics of the UCC is shown. Dialogue Intelligence distinct between Missed and QuickDrop, Snapper combines them as Missed. Dialogue Intelligence distinct between Inbound, Direct, Outbound, Snapper combines them. Dialogue Intelligence distinct between Hunts and Forwards, Snapper combines them. 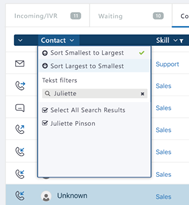 Show Audio, Chat and Autonomous Dialer in IVRInteractive Voice Response (IVR) is a telephone application to take orders via telephone keypad or voice through a computer. By choosing menu options the caller receives information, without the intervention of a human operator, or will be forwarded to the appropriate Agent..
Show Audio, Chat. Email, Campaign Dialer and Autonomous Dialer in Queue. 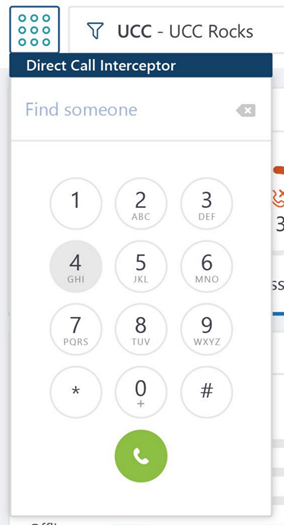 Take = Take the call directly from the queue. Show Audio, Chat. Email, Campaign Dialer and Autonomous Dialer connected. Show Audio, Chat. Email, Campaign Dialer and Autonomous Dialer in QM. 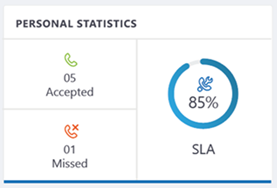 In a busy contact center you want to specify which data your would like to see. In every tab (IVR, Waiting, Connected and Quality) you can filter the columns to only show the data you would like to see. In the next button of the Snapper the options are shown. 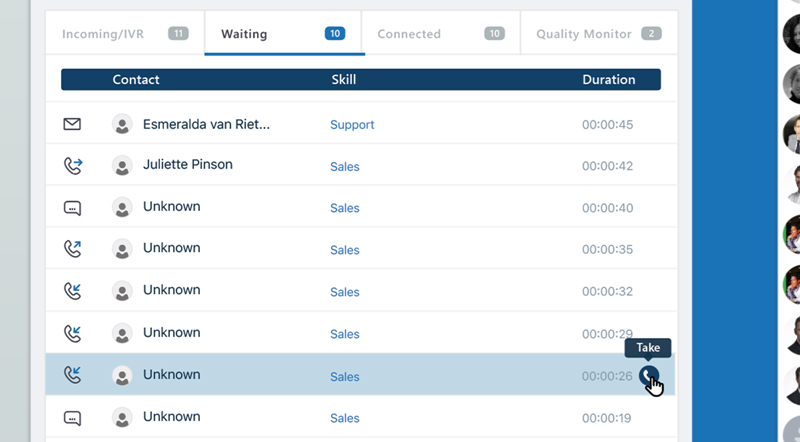 Toggle the value of the wait time between average or longest. This tab will show the settings per plugin.